The first couple of days of my 3 week trip to Myanmar trip I spent in Yangon. With 7,5 million inhabitants, it’s a proper Asian big city, including all the traffic, lots of people and trash in the streets. Even though I am not a big fan of big cities, I didn’t mind Yangon! The Burmese people are very friendly and there are some great places to explore. 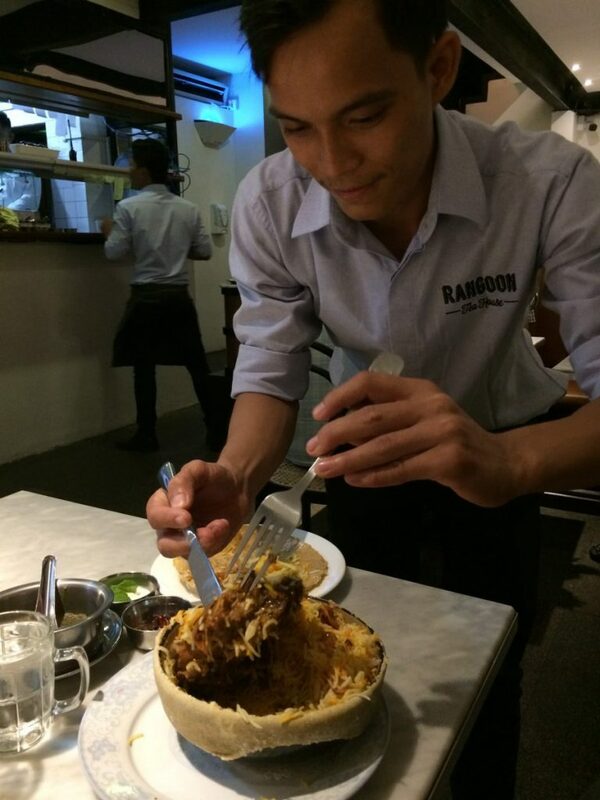 One of my favourite places that I discovered was the Rangoon Tea House. 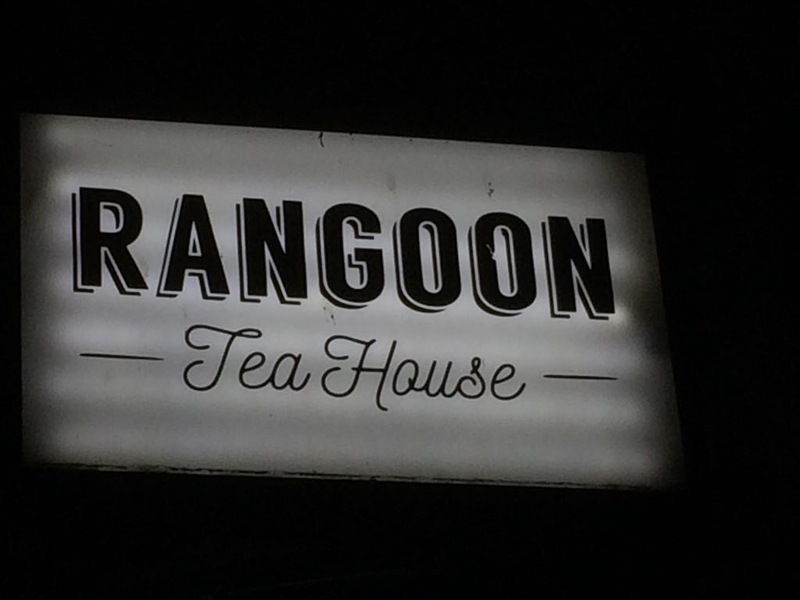 Unlike the traditional Myanmar tea houses, where you sit on small plastic chairs at wooden tables and can pick between tea and soft drinks, the Rangoon tea house brings a completely different experience. 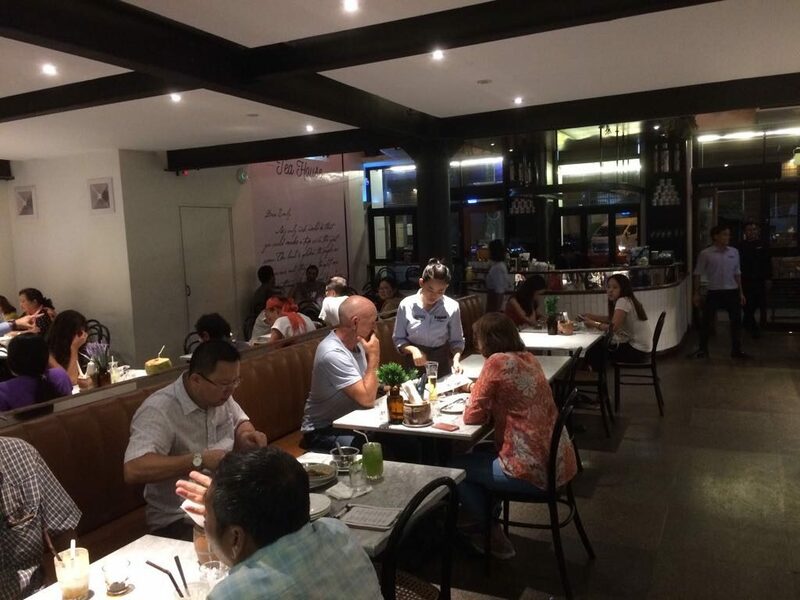 It’s a hip, clean place with lots of atmosphere. This place definitely draws a lot of foreigners, but there were also heaps of local people. It was very busy on the Saturday night we went, but during the week it was a lot more quiet. Like in every big Asian city, there are so many places to choose from when you are looking for something to eat. But thanks to the Myanmar Lonely Planet, I got a hold of this place. It came as a recommended choice and the text sounded very appealing. The second time we were going out for a different, Vietnamese, restaurant. 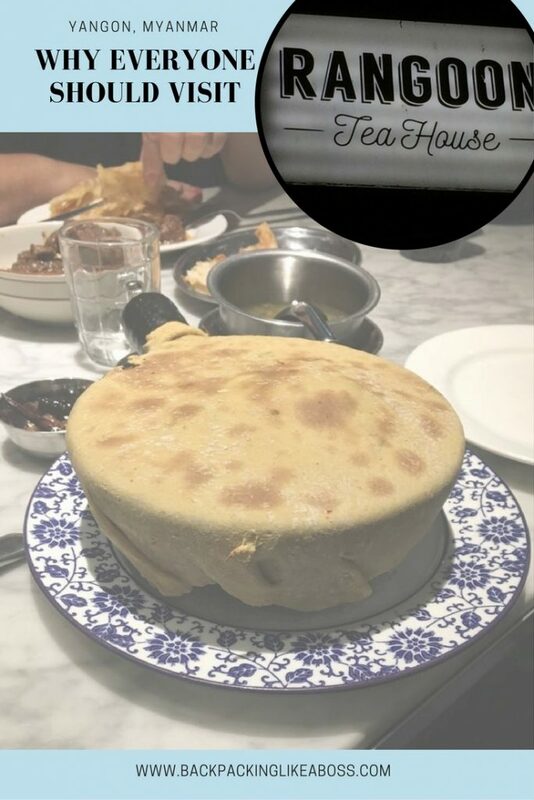 However, we only went out to find out the restaurant had dissapeared completely. The taxi driver couldn’t find our second pick so we ended up at the Rangoon tea house again 🙂 Which was not a punishment at all! Check out below 5 reasons why I think that every traveller should visit the Rangoon Tea House (at least once 😉 ) while staying in Yangon. The lovely flavours and the great presentation makes this Chicken Biryani a true pleasure to eat! I had only eaten Biryani in India before and was pleasantly surprised with this version. Long, fragrant basmati rice, lots of herbs and spices, raisins, nuts and a delicious chicken thigh made this one of my favourite dishes of the trip. I love craft beers. And blonde beers. 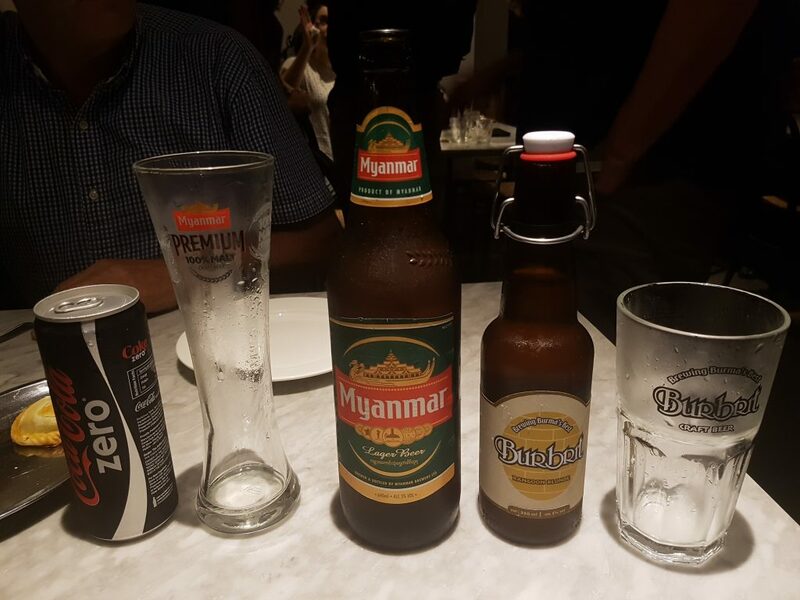 So I definitely love blonde craft beers 😉 Next to the famous Myanmar beer brand, which is widely consumed across the country, I was pleasantly surprised to find craft beers on the menu at Rangoon Tea House. I first got to know empanadas in South-America, where they were on my daily menu 🙂 These stuffed pastries come in many shapes, sizes and with different fillings so it’s always a feast! Nowadays, when I see empanadas anywhere I get excited instantly. The Duck empanadas at the Rangoon Tea House were lovely. They were a tad small, but had great flavours and the pastry was lovely and crispy! You can order the empanadas in portions of 2 – we first ordered one portion but quickly added an extra portion 🙂 They come with a lovely spicy sauce. Getting a good cocktail is not always easy, but at the Rangoon Tea House this was not a problem! With a happy hour from 5-7, the selection of cocktails becomes even more appealing. During these hours, the price of cocktails halves (where as for the beer you get an extra one for free). Although there is plenty to choose from, one of my group mates especially recommended the Spicy Caipirinha – an Asian take on the Brazilian classic! You see the cocktails on many tables in this restaurant and they look amazing! The Burmese people are lovely. And the Rangoon Tea House did a great job of recruiting some of the friendliest people they could find 🙂 You are welcomed with a smile and that smile won’t disappear for the night. 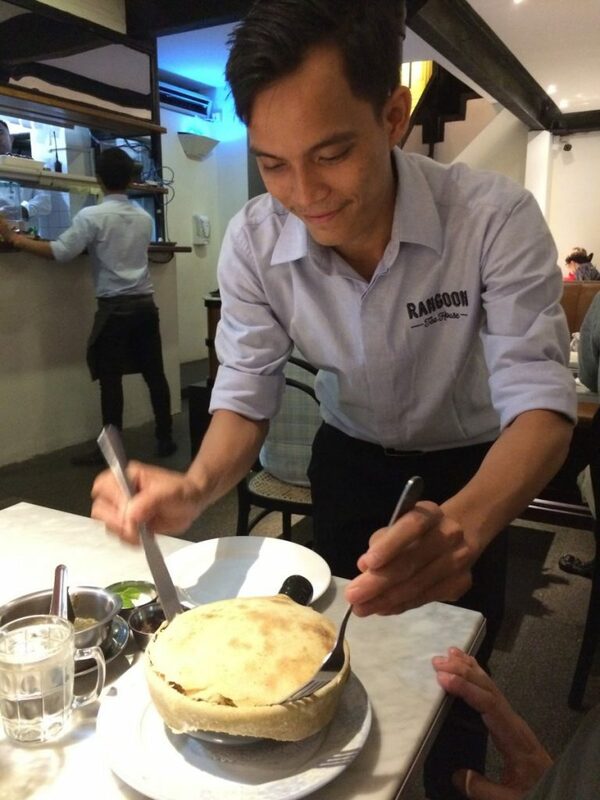 The staff is well trained – they are fast and efficient and you never have to wait long for your drinks. Main courses ranged from 3.000 Kyatt to 12.000 kyatt. Starters, snacks and salads were on the lower end, whilst the chicken biryani was on the higher end. As for the drinks, wine is very expensive, but a big bottle of Myanmar beer is really affordable. You get free, fresh mint-flavoured water for free straight when you arrive and it gets filled up along your meal. From Monday to Friday between 5pm and 7pm there is happy hours for the cocktails and the beers. Especially the first evening we were very pleasantly surprised with the total bill. With 5 people, the whole bill came to 75.000 kyatt. This was 15.000 kyat each – which was about €9! We had a great meal and a couple of drinks in a great atmosphere. Find their tripadvisor and website page here.